Gin should be interesting, yet sophisticatedly balanced. Double distilled through a unique botanical blend and finished with H20 from our glacial aquifer. It's an organoleptic journey through Northern Michigan. 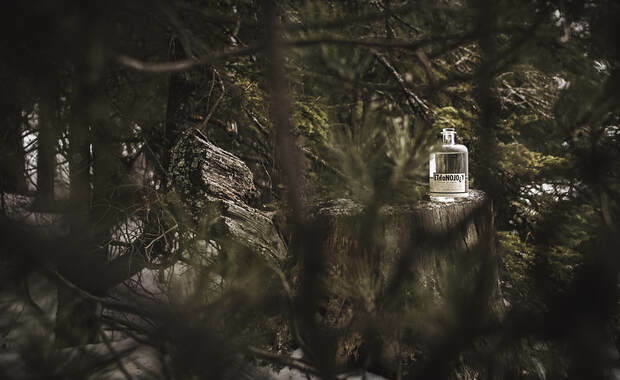 Hand-Foraged Northern Michigan botanicals develop a complex nose of citrus & light conifer, yet the spirit sips clean & simple, with a tinge of pepper on the backside to keep things interesting. Its everything a Gin should be. Complex. Unique. Balanced. Welcome to a new caliber of gin. This rare wild-foraged gin is transmogrified into a truly singular libation when rested on oak. The native botanicals mature into complex spiciness bridging the dichotomy between gin lovers… and everyone else. Welcome to a new caliber of gin. ​Familiarity gives way to bold new flavors, yet the spirit pays subtle homage to its origins. Fragrance of sticky toffee, light cinnamon, & clove provide a flawless introduction to the rich mouthfeel. Robust flavor follows, featuring caramel, nutmeg, & a deeply satisfying peppercorn finish.